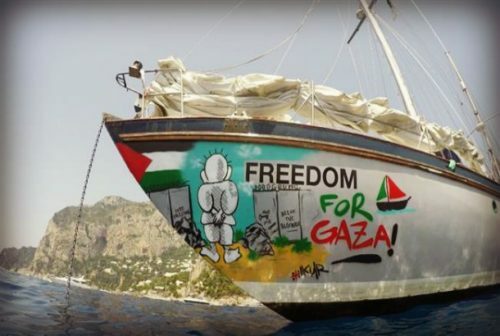 Events from 29 July when the Israeli Navy stormed the Freedom Flotilla al-Awda hijacked and diverted it from its intended course to Gaza to Israel. The last leg of the journey of al-Awda (the boat of return) was scheduled to reach Gaza on 29 July 2018. We were on target to reach Gaza that evening. There are 22 on board including crew with US $15,000 of antibiotics and bandages for Gaza. At 12.31 pm we received a missed call from a number beginning with +81… Mikkel was steering the boat at that time. The phone rang again with the message that we were trespassing into Israeli waters. Mikkel replied that we were in International waters and had right of innocent passage according to maritime laws. The accusation of trespassing was repeated again and again with Mikkel repeating the message that we were sailing in international waters. This carried on for about half an hour, while Awda was 42 nautical miles from the coast of Gaza. Prior to the beginning of this last leg, we had spent two days learning non-violent actions and had prepared ourselves in anticipation of an Israeli invasion of our boat. Vulnerable individuals, especially those with medical conditions, were to sit at the rear of the top deck with their hands on the deck table. The leader of this group was Gerd, a 75 year old elite Norwegian athlete and she had the help of Lucia a Spanish nurse in her group. The people who were to provide a non-violent barrier to the Israelis coming on deck and taking over the boat formed 3 rows – two rows of threes and the third row of two persons blocking the wheel house door to protect the wheel house for as long as possible. There were runners between the wheel house and the rear of the deck. The leader of the boat Zohar and I were at the two ends of the toilets’ corridor where we looked out at the horizon and informed all of any sightings of armed boats. I laughed at Zohar and said we are the Toilet Brigade, but I think Zohar did not find it very funny. It was probably bad taste under the circumstances. I also would be able to help as a runner and would have accessibility to all parts of the deck in view of being the doctor on board. They immediately made to the wheel house overcoming the first row by twisting the arms of the participants, lifting Sarah up and throwing her away. Joergen, the chef, was large to be manhandled so he was tasered before being lifted up. They attacked the second row by picking on Emelia the Spanish nurse and removed her thus breaking the line. They then approached the door of the wheel house and tasered Charlie the first mate and Mike Treen who were obstructing their entry to the wheel house. Charlie was beaten up as well. Mike did not give way with being tasered in his lower limbs so he was tasered in his neck and face. Later on I saw bleeding on the left side of Mike’s face. He was semi-conscious when I examined him. As we entered the back of the deck we were all body searched and ordered to surrender our mobile phones or else they will take it by force. This part of search and confiscation was under the command of a woman soldier. Apart from mobile phones, medicines and wallets were also removed. No one as of today (4 August 2018) got our mobile phones back. Around this time Charlie, the first mate, received the Norwegian flag. He was visibly upset telling all of us that the Norwegian flag had been trampled on. Charlie reacted more to the trampling of the Norwegian flag than to his being beaten and tasered. The soldiers then started asking for the captain of the boat. The boys then started to reply that they were all the captain. Eventually the Israelis figured out that Herman was the captain and demanded to take him to the wheel house. Herman asked for someone to come with him, and I offered to do so. But as we approached the wheel house, I was pushed away and Herman forced into the wheel house on his own. Divina, the well known Swedish singer, had meanwhile broken free from the back and went to the front to look through the window of the wheel house. She started to shout and cry “Stop! Stop! They are beating Herman. They are hurting him”. We could not see what Divina saw, but knew that it was something very disturbing. Later on, when Divina and I were sharing a prison cell, she told me they were throwing Herman against the wall of the wheel house and punching his chest. Divina was forcibly removed and her neck was twisted by the soldiers who took her back to the rear of the deck. I was pushed back to the rear of the boat again. After a while the boat engine started. I was told later by Gerd who was able to hear Herman tell the story to the Norwegian Consul in prison that the Israelis wanted Herman to start the engine, and threatened to kill him if he would not do so. But what they did not understand was that with this boat, once the engine stopped it can only be restarted manually in the engine room in the cabin level below. Arne, the engineer, refused to restart the engine, so the Israelis brought Herman down and hit him in front of Arne making it clear that they will continue to hit Herman if Arne would not start the engine. Arne is 70 years old, and when he saw Herman’s face go ash colour, he gave in and started the engine manually. Gerd broke into tears when she was narrating this part of the story. The Israelis then took charge of the boat and drove it to Ashdod. With Herman settled I concentrated on Larry Commodore, the Native American leader and an environmental activist. He had been voted Chief of his tribe twice. Larry has labile asthma and with the stress all around my fear was that he might get a nasty attack, and needed adrenaline injection. I was taking Larry through deep breathing exercises. However, Larry was not heading for an asthmatic attack, but was engaging an Israeli who covered his face with a black cloth in conversation. This man was obviously in charge. I asked the Israeli man with black mask his name and he called himself Field Marshall Ro…..Larry misheard him and jumped to conclusion that he called himself Field Marshall Rommel and shouted how can he an Israeli take a Nazi name. Field Marshall objected and introduced himself as Field Marshall ? Ronan. As I spelt out Ronan he quickly corrected me that his name is Ronen, and he Field Marshall Ronen was in charge. The Israeli soldiers all wore body cameras and were filming us all the time. A box of sandwiches and pears were brought on deck for us. None of us took any of their food as we had decided we do not accept Israeli hypocrisy and charity. Our chef Joergen had already prepared high calorie high protein delicious brownies with nuts and chocolate, wrapped up in tin foil to be consumed when captured, as we know it was going to be a long day and night. Joergen called it food for the journey. Unfortunately when I needed it most, the Israelis took away my food and threw it away. They just told me ”It is forbidden” I had nothing to eat for 24 hours, refusing Israeli Army food and had no food of my own. As we approached Israel, Zohar, our boat leader, suggested that we should start saying goodbye to each other. We were probably 2-3 hours from Ashdod. We thanked our boat leader, our Captain, the crew, our dear chef, and encouraged each other that we will continue to do all we can to free Gaza and also bring justice to Palestine. Herman, our Captain, who managed to sit up now, gave a most moving talk and some of us were in tears. We knew that in Ashdod there would be the Israeli media and film crews. We will not enter Ashdod as a people who had lost hope as we were taken captive. So we came off the boat chanting “Free Free Palestine” all the way as we came off. Mike Treen, the union man, had by then recovered from his heavy tasering and led the chanting with his mega-voice and we filled the night sky of Israel with Free Free Palestine as we approached. We did this the whole way down the boat into Ashdod. We came directly into a closed military zone in Ashdod. It was a sealed off area with many stations. It was specially prepared for the 22 of us. It began with a security x-ray area. I did not realise they retained my money belt as I came out of the x-ray station. The next station was strip search, and it was when I was gathering up my belongings after being stripped that I realised my money belt was no longer with me. I knew I had about a couple hundred Euros and they were trying to steal it. I demanded its return and refused to leave the station until it was produced. I was shouting for the first time. I was glad I did that as some other people were parted from their cash. The journalist from Al Jazeera Abdul had all his credit cards and USD 1,800 taken from him, as well as his watch, satellite phone, his personal mobile, his ID. He thought his possessions were kept with his passport but when he was released for deportation he learnt bitterly that he only got his passport back. All cash and valuables were never found. They simply vanished. I was cold and hungry, wearing only one tee-shirt and pants by the time they were through with me. My food was taken away; water was taken away, all belongings including reading glasses taken away. My bladder was about to explode but I was not allowed to go to the toilet. In this state I was brought out to two vehicles – Black Maria painted gray. On the ground next to it were a great heap of ruqsacks and suit cases. I found mine and was horrified that they had broken into my baggage and took almost everything from it – all clothes clean and dirty, my camera, my second mobile, my books, my Bible, all the medicines I brought for the participants and myself, my toiletries. The suitcase was partially broken. My ruqsack was completely empty too. I got back two empty cases except for two dirty large man size tee-shirts which obviously belonged to someone else. They also left my Freedom Flotilla tee-shirt. I figured out that they did not steal the Flotilla tee-shirt as they thought no Israeli would want to wear that tee-shirt in Israel. They had not met Zohar and Yonatan who were proudly wearing theirs. That was a shock as I was not expecting the Israeli Army to be petty thieves as well. So what had become of the glorious Israeli Army of the Six Day War which the world so admired? At 6.30 am 31 July 2018, we heard Larry yelling from the men’s cell across the corridor that he needed a doctor. He was obviously in great pain and crying. We women responded by asking the wardens to allow me to go across to see Larry as I might be able to help. We shouted “We have a doctor” and used our metal spoons to hit the iron cell gate to get their attention. They lied and said their doctor would be over in an hour. We did not believe them and started again. The doctor actually turned up at 4 pm, about 10 hours later and Larry was sent straight to hospital. We, the six women on board al-Awda, had learnt that they tried to completely humiliate and dehumanise us in every way possible. We were also shocked at the behaviour of the Israeli Army especially petty theft and their treatment of international women prisoners. Men jailors regularly entered the women’s cell without giving us decent notice to put our clothes on. They also tried to remind us of our vulnerability at every stage. We know they would have preferred to kill us but, of course, the publicity incurred in so doing might be unfavourable to the international image of Israel. We cannot accept this. We have to speak up, stand up against this lawlessness, oppression and brutality. We were completely unarmed. Our only crime according to them is we are friends of the Palestinians and wanted to bring medical aid to them. We wanted to brave the military blockade to do this. This is not a crime. In the week we were sailing to Gaza, they had shot dead 7 Palestinians and wounded more than 90 with live bullets in Gaza. They had further shut down fuel and food to Gaza. Two million Palestinians in Gaza live without clean water, with only 2-4 hours of electricity, in homes destroyed by Israeli bombs, in a prison blockaded by land, air and sea for 12 years. The hospitals of Gaza since the 30 March had treated more than 9,071 wounded persons, 4,348 shot by machine guns from a hundred Israeli snipers while they were mounting peaceful demonstrations inside the borders of Gaza on their own land. Most of the gun-shot wounds were to the lower limbs and with depleted treatment facilities the limbs will suffer amputation. In this period more than 165 Palestinians had been shot dead by the same snipers, including medics and journalists, children and women. The chronic military blockade of Gaza has depleted the hospitals of all surgical and medical supplies. This massive attack on an unarmed Freedom Flotilla bringing friends and some medical relief is an attempt to crush all hope for Gaza. As I write I learnt that our sister Flotilla, Freedom, has also been kidnapped by the Israeli Navy while in international waters. BUT we will not stop. We must continue to be strong to bring hope and justice to the Palestinians and be prepared to pay the price, and to be worthy of the Palestinians. As long as I survive I will exist to resist. To do less will be a crime. Malaysian-born Swee Ang is the first female Orthopaedic Consultant appointed to St Bartholomew ('Barts') and the Royal London Hospitals. She has worked as Trauma and Orthopaedics consultant in the refugee camps of Lebanon, later for the UN in Gaza, and the World Health Organization in the West Bank and Gaza. Dr. Ang is also Founder and Patron of the British charity Medical Aid for Palestinians (MAP). She is the co-author of War Surgery and Acute Care of the War Wounded, and also wrote From Beirut to Jerusalem documenting her experience in the Palestinian Refugee Camps in Lebanon and Gaza. Read other articles by Swee. This article was posted on Monday, August 6th, 2018 at 2:08pm and is filed under Activism, Crime, Crimes against Humanity, Culture, Disinformation, Gaza, Health/Medical, Human Rights, Incarceration, Israel, Media, Militarism, Narrative, Palestine, Propaganda, Resistance, Violence.